The First Virtual World – The SenSei O.S. Over the weekend I was doing some research for my upcoming book on ‘Social Media, The Impact On Your Bottom Line’ where I am collaborating with Chris Heuer, Founder of the Social Media Clubs worldwide and Robert Scoble, the famous Microsoft Blogger and “Scoble-izer”. I was asked what my first experience was with Virtual World’s or Virtual Environments similar to Second Life. After thinking about my history in the computer industry since it started in the mid ‘70’s, I came upon an epiphany. The first virtual environment I ever came across was the one I invented! Along with several dozen world’s firsts, 18 inventions in the Smithsonian Institution, and 14 more in the Computer History Museum, I never realized that I was one of, if not the first to ever create a virtual environment. It was called SenSei for Master / Teacher; Master your environment, and Teach yourself. It was created as an operating system for the then most popular computers, the Apple IIe and the Macintosh. 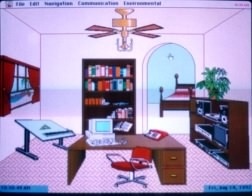 This virtual environment was indented to aid the first time computer user and more specifically, the physically disabled. The idea was to develop a virtual on-screen world that the user could move around in and be able to select items that were easily recognizable that represented both standard and custom computer software applications by using voice recognition (another of my firsts), or a HeadMouse (control the mouse by moving your head). Back in the mid 1980’s, by definition, a disabled user had never operated a computer before due to their inability to use a keyboard or mouse (when it was later added). 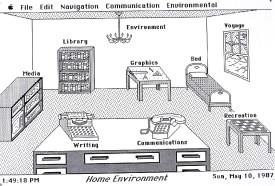 The disabled could not open or hold a user manual so it was necessary to create an environment where the new user could feel at home with the images in the virtual room. To design these objects the term I used and even printed and placed on the wall in our engineering department was “Pre-Computer Graphic Metaphor”. This meant if you wanted to type, you selected the picture of the typewriter. 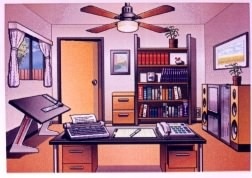 If you want to use the hands free telephone dialer, you selected the picture of the telephone, the drafting table was for the drawing program, etcetera. The SenSei operating system went on to become the archetypes for the Apple’s Newton and Microsoft’s Bob operating systems. Even though this virtual world wasn’t nearly as sophisticated as Second Life, it did give its users the opportunity to explore new interactive virtual worlds. It also gave quadriplegics an opportunity for the very first time to control their own first life environment. There were doors available from the main “office” where you could enter a library and read or have a 100 books read to them, which the computer would read aloud to you. They could for the first time, answer or place a telephone call, control electronic hospital bed, select a room from the floor plan and turn on, off, or dim 256 lights and appliances, change the channel on the TV, play the VCR, lock the door, adjust the A.C., perform word processing, spread sheets, databases, draw, and even call a nurse, all through their virtual world. This system I created is actually credited as the “First Computer To Save A Human Life”, by Steve Jobs of Apple and was on display for more than a decade at Apple Computer’s world headquarters in Cupertino, CA. It was eventually moved to the William Gates Computer Science Building at Stanford University. While working with the disabled, I was also credited with creating the world’s first software versions of owner’s manuals. As mundane as it would seem now, it actually turned into a big battle between Apple Computer’s Advanced Technology Group and myself. I argued that someday, we wouldn’t have to ‘print’ manuals anymore, which is very expensive. I showed them how I created an entire manual complete with photographs, diagrams, and text using Hypercard. This way distribution was free and it was easier for the user to access and search. Also, a quadriplegic who couldn’t physically ‘hold’ a hardcopy manual could read or have the manual read to them at will. For more than five years we fought about this. They argued that there was a tangible element to their guides that customers psychologically depended upon. Apple’s ATG insisted to the point where they said they would pull my Apple Developer’s Certification if I didn’t comply and supply a hardcopy user’s guide. They finally won the argument when in 1994, I hired the P.R. company, Francine Hardaway & Associates and created the 200 page full color manual. When it was complete, I had the agency print only two copies, one for Apple and one for my archives. This project also gave me the opportunity to meet Dr. Thomas Furness, one of the founders of Virtual Reality. He, Jaron Lanier, and Dr. Sam Wise who was on my Board Of Directors at the time are the team who under a grant from NASA, developed the ‘Power Glove” and “Virtual Reality” at the Wright Patterson Air Force Base in Ohio. Dr. Furness, myself and… William Gates Sr., who was a Seattle attorney and a great guy, spent the day together at the University of Washington discussing Virtual Reality, Virtual Worlds, funding for my company, and as Bill Gates Senior would call him “My Boy Billie”. I believe that this conversation lead to the premise of the movie “Full Disclosure”, with Michael Douglas, and Demi Moore, and Microsoft’s Bob O.S. Can you imagine all that name-dropping in one paragraph? Well, I can’t believe it either. I have been called the Forrest Gump of the computer Industry. I guess sometimes when a regular person doing regular things just uses a little Innovative Thinking, they actually could be making history.